Holi which the Assamese calls Phagwah is a festival of colors. Bengali and the Oriya people call it doljatra and dolajatra respectively. For the Mathura and Vrindavan people Holi bears a special significance. It is observed by the Indian diaspora population in Surinam, Malayasia, South Africa, UK, USA, Mauritus and Fiji. In the Gregorian calendar it occurs in March and in Bengali calendar it is celebrated on the Phalgun Purnima. Mythologically, sister of Hiranyakashipu used the term ‘holika’. In Nepal, Holi is known as the festival of ‘Fagu’. The century old six day festival of the Manipuri people called Yaosang is associated with Holi which they observe in the full moonlit night of Lamta (Phalgun). In Kerala, Holi is called Ukkuli in Konkani and Manjal Kuli in Malayalam. In the rural Maharashtra it is known as ‘Rangapanchami’. In Trinidad and Tobago it is called ‘phagwa’ and ‘phagwah’. ‘Phakuwa’ is another festival. Among the Bhil tribes in Rajasthan and Madhya Pradesh, youths are allowed to form liaisons in this medley which may lead to marriages at times. In all these festivities of Holi, water mingled with color is sprinkled. The concept of dry holy was introduced by Rabindra Nath Tagore in Shantiniketan long ago. Today in the days of water scarcity in Maharashtra and other places in India, there is a vigorous campaign for ‘Dry Holi’. The famous Bollywood actor Amitabh Bachchan wants people in India to avoid using water in light of the drought in much of Western India’s Maharashtra state. ‘Play a dry Holi’- said the Big ‘B’ in a pre-Holi tweet to the people. Karishma Kapoor also joined the Tweet chorus: “Try and make it a safe and dry Holi’ keeping in mind the drought –affected areas of the country”. Spritual Guru Sri Sri Ravi Shankar also tweeted: “I appeal to the people of Maharashtra to play dry Holi with chandan (sandalwood paste) and flowers and save water’. Not only in Maharashtra, in the whole country can we save water. Holi colors sold in markets are oxidized metals and they can harm our skin as well. In extreme cases such water sprinkling may cause even skin cancer. Throwing of water balloons can cause injury to the eyes. According to their researched fact sheet on Holi, the pastes contain very toxic chemicals that can have severe health effects. The dry colors commonly known as gulals have two components – a colorant that is toxic and a base which could be either asbestos or silica, both of which cause health problems. Heavy metals contained in the colorants can cause asthma , skin diseases and adversely affect the eyes Wet colors mostly use Gentian violet as a color concentrate which can cause skin dis-coloration and dermatitis. Around 2001, two environmental groups called Toxics Link and Vatavaran based in Delhi, did a study on all the three available categories of colors available in the market –pastes dry colors and water colors. In earlier times when festival celebrations were not so much commercialized Holi colors were prepared from the flowers of trees that blossomed during spring, such as the Indian Coral Tree (parijat) and the Flame of the Forest (Kesu), both of which have bright red flowers. These and several other blossoms provided the raw material from which the brilliant shades of Holi colors were made. Most of these trees also had medicinal properties and Holi colors prepared from them were actually beneficial to the skin. Over the years with the disappearance of trees in urban areas and greater stress for higher profits these natural colors came to be replaced by industrial dyes manufactured through chemical processes. Environment friendly Holi is the need of the hour. Dainik Bhaskar’s water conservation campaign ‘Jal Satyagraha’, the contest aims to promote dry Holi through thought-provoking and action oriented creative solutions in the print and radio medium. Every year, millions of gallons of water are wasted while playing Holi, leading to the faster depletion of water resources across the country. The use of chemicals leads to pollution of water. The water conservation campaign of Dainik Bhaskar ‘Jal Satyagraha’ aims to promote dry Holi through thought-provoking and action oriented creative solutions in the print and radio medium. Our whole focus is to make individuals take a vow to avoid using wet colors and chemicals and in the process help conserve water. There is not enough water due to poor rains last year. So people should notwaste water. The Festival of Colors is commemorated in America. An enthusiast group of Americans is excited and thrilled to play colors. Incidentally, it is dry holy celebrated over there. Thousands of people from both India and overseas assembled at Santiniketan. Tagore re-introduced ‘Dol’ as Vasanta Utsav in his Visva Bharati University in Bolepur. The girls, resplendent in golden sarees and garlands of fragrant flowers, and boys in the traditional kurta-Pajama, took part in a dance programme to the strains of Tagore songs that exhorted everyone to mingle in joy. This year in Rabindra Bharati and Calcutta University - it was dry Holi celebrated in both the campus. 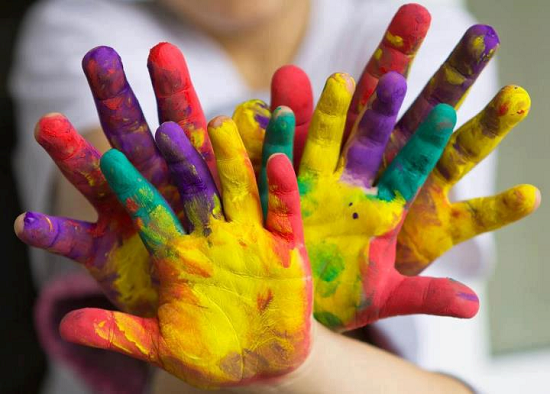 I am an artist based in Uk, I am currently writing a book about painting in different media and I was looking for a picture of pigments for the colour chapter of my book when I came across this beautiful photo of hands on your website. I wonder if this is your photo and if you would give me permission to include it in my book with your copyright and credit. I would be very grateful if you could advise me about this.